A recent study reports that one-third of Americans polled say the first thing they notice about a person is his or her smile. Thus, if you have stained teeth, the individual you meet may form an unfavorable opinion of you based on the way your ivories look. One of the newer techniques available now to address this problem is charcoal whitening, but is it safe? Your cosmetic dentist is weighing in to give you some details about this new trend. What is Activated Charcoal Whitening? When you hear the word charcoal, you may automatically think of a barbecue in your backyard, but the kind that we are talking about here is activated charcoal. It was originally used by medical emergency technicians and doctors to reverse the effects of poisoning and drug overdoses by absorbing the toxins that cause the harmful effects. However, it would later be discovered that the same type of charcoal has the ability to whiten teeth. 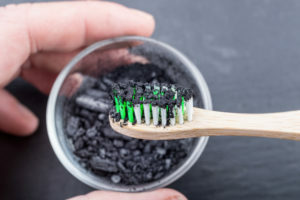 The basic premise is that just as activated charcoal can absorb the toxins that harm the body, it can also lift stubborn stains from your teeth. At the end of the day, though, you want to know if the process is safe. One of the reasonable reservations about activated charcoal whitening involves the safety of ingesting it. It has been found to be okay in that department, but it does pose a different danger if you’re not very careful. Because it’s an abrasive, it can cause chipping, scratching or other damage to the enamel (the hard, outer surface) of your teeth. Thus, it’s important to know how to use the product properly. You can purchase the mineral from your local health food store, which will usually have it in a tablet form. Remove 1-2 tablets and crush them into a fine powder. Next, add just enough water to make a paste with the charcoal, and carefully place small dabs of the mixture on your teeth. Let the mixture sit on your teeth for around three minutes, then rinse your mouth, thoroughly, several times to remove it. The final step is to brush your teeth as you normally would. One thing to keep in mind is that there are no definitive data sets that document the effectiveness of this method. Thus, researchers are still investigating its overall proficiency at safely whitening teeth. Looking for a More Conventional Route? If you’re looking for a more conventional route to whitening your teeth, your local dentist has some other options, which include his DayWhite and NiteWhite processes. They offer some attractive benefits – one being that you won’t have to worry about damaging your teeth. This is because you’ll be under the expert care of a trained professional, while maintaining the convenience of being able to whiten your teeth at home. If you’re interested in learning more about the process, reach out to your dentist to schedule a consultation. A graduate of the UCLA School of Dentistry, Dr. Nelson Y. Howard has over 30 years of experience practicing dentistry. An Accredited Member of the American Academy of Cosmetic Dentistry (AACD), he is considered an authority in aesthetic dental care. You can learn more about how Dr. Howard can help you get the smile of your dreams through his website.